wasn’t hatched by cultic Freemasons seeking to expand world commerce in their search for ever more lucrative sources of revenue – as we are repeatedly told by Christian Quietists who promote every reason they can devise to separate direct Christian influence from society and government. Nor was it merely a peripheral ideal that bubbled up from a multitude of otherwise unimportant and isolated pockets of European religionists, who found themselves outside the laws of civil society due to doctrines and practices which were not only odd, but often antagonistic to the established social and political order, and who thus found it necessary to escape to the New World to avoid the imprisonment they justly deserved – as today’s domestic enemies of Christianity want our school-children to learn. On the contrary, it was an idea devised by the beloved Swedish King, Gustavus Adolphus – a General of several European wars, considered by many to be the Greatest General of all times, and a pious Lutheran, who, being requested by the Evangelical German Princes to aid them against the Roman Catholic forces of the Empire, in 1630 took up with them the fight to protect the Right of Free Conscience in which they had been desperately embroiled already for twelve years. He fought gallantly, and died on the battlefield at Lützen, in 1632. So aggrieved was he by the plight of Protestants in the face of State sponsored persecution, that already in 1624, he had begun devising a plan for a colony in the New World which would guarantee and protect the Fundamental Rights of the people, and consulted broadly with his counterparts in Europe on the principles and logistics involved in such an endeavor. At the Diet of Estates in 1627, there was formed an agreement among the Protestant aristocracy and many prominent businessmen on these principles, and a company was formed to begin carrying out the plan. That plan was interrupted by war, but shortly after the death of Gustavus, his faithful successor, Axel Oxenstiern, renewed the plan and carried it out. What follows is nothing other than repressed history. It is taken from the second part of the book, Luther and the Reformation: The Life-Springs of Our Liberties, written in 1888, by Rev. Dr. Joseph A. Seiss. This is the same book from which we have been publishing our history of Dr. Martin Luther (), which is contained in the first part of the book. As Seiss intended to show with his broad narrative, forasmuch as there can be no doubt that the Thirty Years’ War was a direct result of the Reformation, indeed, a continuation of Christian suffering under Imperial persecution for their Confession of Free Conscience, so too it can be strongly argued that the early colonization of America, and the lasting principles established by those efforts, are also a direct continuation of Luther’s Reformation. (NOTE: Rev. Joseph A. Seiss was a 19th Century Lutheran pastor, serving congregations in Philadelphia, Pennsylvania, and a co-founder of the very influential General Council along with Charles Porterfield Krauth. 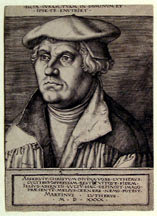 One can read more details about him in the introduction to our first part of Luther’s history. SECTION I: THE HISTORY AND THE MEN. IT was in 1492, just nine years after Martin Luther’s birth, that the intrepid Genoese, Christopher Columbus, under the patronage of Ferdinand, king of Spain, made the discovery of land on this side of the Atlantic Ocean. A few years later the distinguished Florentine, Americus Vespucius, set foot on its more interior coasts, described their features, and imprinted his name on this Western Continent. But it was not until more than a century later that permanent settlements of civilized people upon these shores began to be made. During the early part of the seventeenth century several such settlements were effected. A company of English adventurers planted themselves on the banks of the James River and founded Virginia (1607). The Dutch of Holland, impelled by the spirit of mercantile enterprise, established a colony on the Hudson, and founded what afterward became the city and State of New York (1614). Then a shipload of English Puritans, flying from religious oppression, landed at Plymouth Rock and made the beginning of New England (1620). A little later Lord Baltimore founded a colony on the Chesapeake and commenced the State of Maryland (1633). But it was not until 1637-38 that the first permanent settlement was made in what subsequently became the State of Pennsylvania. From the year 1611 to 1632 there was upon the throne of Sweden one of the noblest of kings, a great champion of Religious Liberty, the lamented and ever-to-be-remembered GUSTAVUS ADOLPHUS. In his profound thinking to promote the glory of God and the good of men his attention rested on this vast domain of wild lands in America. He knew the sorrows and distresses which thousands all over Europe were suffering from the constant and devastating religious wars, and the purpose was kindled in his heart to plant here a colony as the beginning of a general asylum for these homeless and persecuted people, and determined to foster the same by his royal protection and care. For the ensuing five years the attention and energies of Sweden were preoccupied, first with the Polish, and then with these wars, and the colonization scheme was interrupted. Only a few days before that dreadful battle he spoke of his colonization plan, and commended it to the German people at Nuremberg as “the jewel of his kingdom;” but with the king’s death the company disbanded. We could almost wish that Gustavus had lived to carry out his humane and magnificent proposals with reference to this colony as well as for Europe; but his work was done. What America lost by his death she more than regained in the final success and secure establishment of the holy cause for which he sacrificed his life. The plan of this illustrious king was to found here upon the Delaware River a Free State under his sovereign protection, where the laborer should enjoy the fruit of his toil, where the Rights of Conscience should be preserved inviolate, and which should be open to the whole Protestant world, then and for long time engaged in bloody conflict with the papal powers for the maintenance of its existence. Here all were to be secure in their persons, their property, and their religious convictions. It was to be a place of refuge and peace for the persecuted of all nations, of security for the honor of the wives and daughters of those fleeing from sword, fire, and rapine, and from homes made desolate by oppressive war. It was to be a land of universal liberty for all classes, the soil of which was never to be burdened with slaves.4 And in all the colonies of America there was not a more thoroughly digested system for the practical realization of these ideas than that which the great Gustavus Adolphus had thus arranged. Nor did it altogether die with his death. His mantle fell upon one of the best and greatest of men. 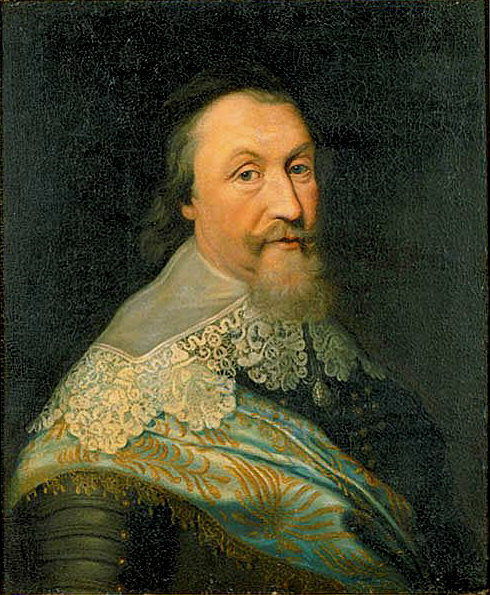 Axel Oxenstiern, his friend and prime minister, and his successor in the administration of the affairs of the kingdom, was as competent as he was zealous to fulfill the wise plans and ideas of the slain king, not only with reference to Sweden and Europe, but also with regard to the contemplated colony in America. Having taken the matter into his own hands, on the 10th of April, 1633, only a few months after Gustavus’s death, Oxenstiern, renewed the movement which had been laid aside, and repeated the offer to Germany and other countries, inviting general co-operation in the noble enterprise. 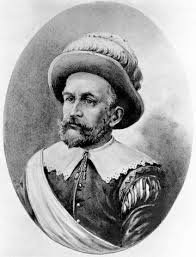 Peter Minuit, a member of a distinguished family of Rhenish Prussia, who had been for years the able director and president of the Dutch mercantile establishment on the Hudson, presented himself in Sweden, and entered into the matter with great energy and enthusiasm. And by the end of 1637 or early in 1638 two ships were seen entering and ascending the Delaware, freighted with the elements and nucleus of the new State, such as Gustavus had projected. These ships, under Minuit, landed their passengers but a few miles south of where Philadelphia now stands, and thus made the first beginning of what has since become the great and happy Commonwealth of Pennsylvania. This was six years before Penn was born. WAS PENN AWARE OF THESE PLANS? How far William Penn was illuminated and influenced by the ideas of the great and wise Gustavus Adolphus in reference to the founding of a Free State in America as an asylum for the persecuted and suffering people of God in the Old World, is nowhere told; but there is reason to believe that he knew of them, and took his own plans from them. A few facts bearing on the point may here be noted. One peculiarly striking is, that the same plan and principles with reference to such a colonial state which Penn brought hither in the ship Welcome in 1682 were already matured and widely propounded by the illustrious Swedish king more than half a century before they practically entered Penn’s mind. Another is, that these proposals and principles were generally promulgated throughout Europe – first by Gustavus and those associated with him in the matter, and then again by Oxenstiern, in Germany, Holland, and other countries. where he says both Calvinists and Lutherans received him with gladness of heart. He visited Mayence, Worms, Mannheim, Mulheim, Düsseldorf, Herwerden, Embaden, Bremen, etc., etc., concerning which the editor of his Life and Writings says he had “interesting interviews with many persons eminent for their talents, learning, or social position.” Among them were such as Elizabeth, Princess Palatine, niece of Charles I of England and the daughter of the king of Bohemia, the special friend of Gustavus Adolphus, who died of horror on hearing that Gustavus was slain; Anna Maria, countess of Hornes; the countess and earl of Falkenstein and Brück; the president of the council of state at Embaden; the earl of Donau, and the like; among all of which it is hardly possible that he should have failed to meet with the proposals which had gone out over all Protestant Europe from the throne of Sweden. Nor is there any evidence that William Penn had thought of founding a Free Christian State in America until immediately after his return to England from this tour on the Continent. Furthermore, the plans of Gustavus respecting his projected colony on the Delaware were well understood in official circles in England itself, especially in London, from 1634. John Oxenstiern, brother of the great chancellor, was at that time Swedish ambassador in London, and in that year he obtained from King Charles I a renunciation and cession to Sweden of all claims of the English to the country on the Delaware growing out of the rights of first discovery, and for the very purposes of this colonial Free State and asylum first projected by the Swedish king. THE SWEDES IN ADVANCE OF PENN. We are left to our own inferences from these facts. But, however much or little Penn may have been directly influenced and guided by what Gustavus Adolphus had conceived and elaborated on the subject, the wise and noble conception which he brought with him for practical realization in 1682 was known to the European peoples for more than fifty years before he laid hold on it. The same had also been one of the chief sources of the inspiration of Lord Baltimore in the founding of the colony of Maryland, of which Penn was not ignorant. And the same, not unknown to him, had already begun to be realized here in what is now called Pennsylvania a full forty-four years before his arrival. When Penn landed he found a town and courthouse at New Castle, and a town and place of public assemblage at Upland, and a Christian and Free people in possession of the territory, with whom it was necessary for him to treat before his charter could avail for the planting of his colony. The land to which the Swedes had acquired title (by England’s release to Sweden of all claim from right of discovery, by charter from Sweden, by purchase from the Indians, first under Minuit, the first governor, and then under his successor, Governor Printz, and by other purchases or agreements) was the west bank of the Delaware River from Cape Henlopen to Trenton Falls, and thence westward to the great fall in the Susquehanna, near the mouth of the Conewaga Creek, which included nearly the whole of Eastern Pennsylvania and Delaware. The fortunes of war, in Europe and between the colonies, in course of time complicated the titles to one and another portion of this territory, but the Swedes and Dutch occupied and held the most prominent parts of it by right of actual possession when and after Penn's charter was granted. But when Penn arrived he brought with him letters patent from Charles II, king of England, to this same district of country and the wilds indefinitely beyond it, having also obtained from his friend, the king’s brother, the duke of York, full releases of the claims vested in him to the “Lower Counties,” which now form the State of Delaware. Penn was accompanied by from sixty to seventy colonists – all that survived the scourge which visited them in their passage across the sea. He landed first at New Castle, of which the Dutch of New York had by conquest obtained possession. To them he made known his grants and his plans, and succeeded in securing their acquiescence in them. Thence he came to Upland (Chester), the head-quarters of the Swedes, who “received their new fellow-citizens with great friendliness, carried up their goods and furniture from the ships, and entertained them in their own houses without charge.” His proposals with regard to the establishment of a united commonwealth they also received with much favor. And immediately thereupon he convened a general assembly of the citizens, which sat for three days, by which an act was passed for the consolidation of the various interests and parties on the ground, a code of general regulations adopted, and the necessary features of a common government enacted; all of which together formed the basis of our present commonwealth. 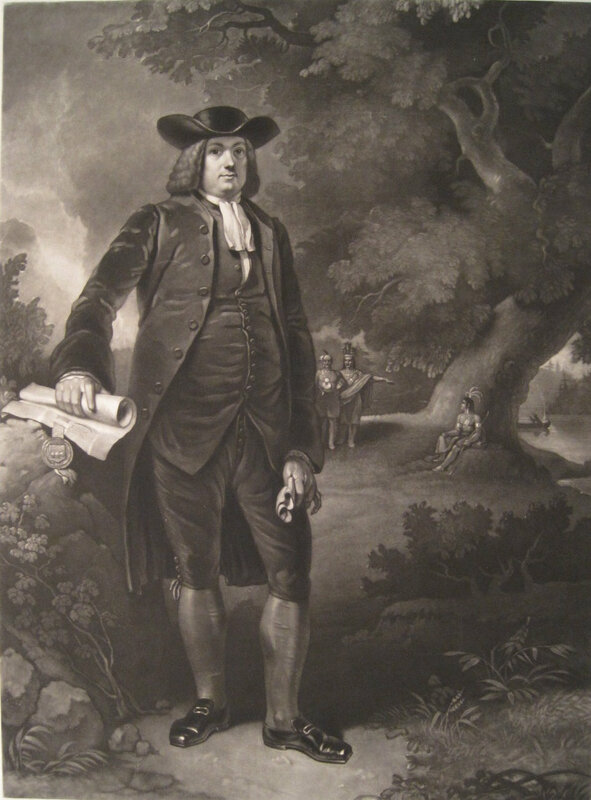 The name which Penn had chosen for the territory of his grant was Sylvania, but the king prefixed the name of Penn and called it Penn’s Sylvania (Penn’s Woods), in honor of the recipient’s father, Sir William Penn, distinguished officer in the British navy. Penn sought to have the title changed so as to leave his own name out, as he thought it savored too much of personal vanity; but his efforts did not avail. And thus our great old commonwealth took the name of Pennsylvania, and the city of Philadelphia was laid out and named by Penn himself as its capital. THE MEN OF THOSE TIMES. In dwelling upon the founding of our happy commonwealth it is pleasant to contemplate how enlightened and exalted were the men whom Providence employed for the performance of this important work. Many are apt to think ours the age of culminated enlightenment, dignity, wisdom, and intelligence, and look upon the fathers of two and three hundred years ago as mere pygmies, just emerging from an era of barbarism and ignorance, not at all to be compared with the proud wiseacres of our day. Never was there a greater mistake. The shallowness and flippancy of the leaders and politicians of this last quarter of the nineteenth [and twentieth...] century show them but little more than school-boys compared with the sturdy, sober-minded, deep-principled, dignified, and grand-spirited men who discovered and opened this continent and laid the foundations of our country’s greatness. And those who were most concerned in the founding of our own commonwealth suffer in no respect in comparison with the greatest and the best. I have named the illustrious GUSTAVUS ADOLPHUS as the man, above all, who first conceived, sketched, and propounded the grand idea of such a state. What other colonies reached only through varied experiments and gradual developments, Pennsylvania had clear and mature, in ideal and in fact, from the very earliest beginning; and the royal heart and brain of Sweden were its source. 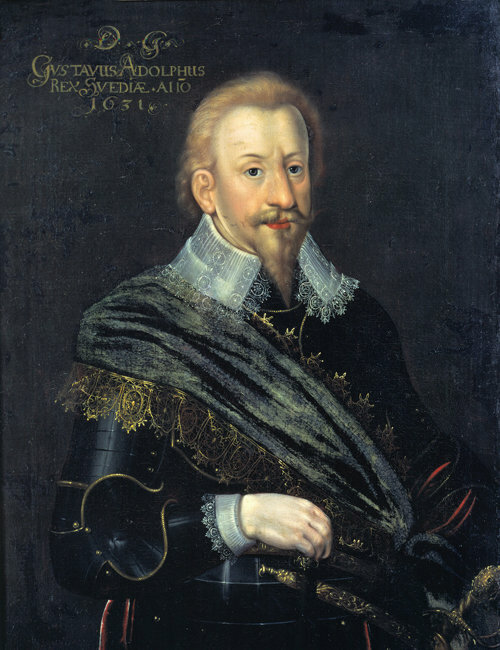 Gustavus Adolphus was born a prince in the regular line of Sweden’s ancient kings. His grandfather, Gustavus Vasa, was a man of thorough culture, excellent ability, and sterling moral qualities. When in Germany he was an earnest listener to Luther’s preaching, became his friend and correspondent, a devout confessor and patron of the evangelic faith, and the wise establisher of the Reformation in his kingdom. Adolphus inherited all his grandfather’s high qualities. He was the idol of his father, Charles IX, and was devoutly trained from earliest childhood in the evangelic faith, educated in thorough princely style, familiarized with governmental affairs from the time he was a boy, and developed into an exemplary, wise, brave, and devoted Christian man and illustrious king. He ascended the throne when but seventeen years of age, extricated his country from many internal and external troubles, organized for it a new system, and became the hero-sovereign of his age. He was one of the greatest of men, in cabinet and in field as well as in faith and humble devotion. He was a broad-minded statesman and patriot, one of the most beloved of rulers, and a philanthropist of the purest order and most comprehensive views. That evangelical Christianity which Luther and his coadjutors exhumed from the superincumbent rubbish of the Middle Ages was dearer to him than his throne or his life. The pure Gospel of Christ was to him the most precious of human possessions. For it he lived, and for it he died. One of his deep-souled hymns, sung along with Luther’s Ein Feste Burg at the head of his armies in his campaigns for Christian liberty, has its place in our Church-Book today. And the bright peculiar star which appeared in the heavens at the time he was born fitly heralded his royal career. AXEL OXENSTIERN, his friend, companion, and prime minister, was of like mind and character with himself. He was high-born, religiously trained, and thoroughly educated in both theology and law in the best schools which the world then afforded. He was Sweden’s greatest and wisest counselor and diplomatist, liberal-minded, true-hearted, dignified, and devout. In religion, in patriotism, in earnest doing for the profoundest interests of man, he was one with his illustrious king. He negotiated the Peace of Kmered with Denmark, the Peace of Stolbowa with Russia, and the armistice with Poland. He accompanied his king in the campaigns in Germany, having charge of all diplomatic affairs and the devising of ways and means for the support of the army in the field, whilst the king commanded it. He won no victories of war, but he was a choice spirit in creating the means by which some of the most valuable of such victories were achieved, and conducted those victories to permanent peace. When Gustavus Adolphus fell at Lützen a sacrifice to Religious Liberty, the whole administration of the kingdom was placed in Oxenstiern’s hands. The congress of foreign princes at Heilbronn elected him to the headship of their league against the papal power of Austria; and it was his wisdom and heroism alone which held the league together unto final triumph. Bauer, Torstensson, and Von Wrangle were the flaming swords which finally overwhelmed that power, but the brain which brought the fearful Thirty Years’ War to a final close, and established the evangelical cause upon its lasting basis of security by the Peace of Westphalia (1648), was that of Axel Oxenstiern, the very man who sent to Pennsylvania its original colonists as the founders of a Free State. A kindred spirit was PETER MINUIT, the man whom Oxenstiern selected and commissioned to accompany these first colonists to the west bank of the Delaware, and to act as their president and governor. He too was a high-born, cultured, large-minded Christian man. He was an honored deacon in the Walloon church at Wesel. Removing to Holland, his high qualities led to his selection by the Dutch West India Company as the fittest man to be the first governor and director-general of the Dutch colonies on the Hudson. His great efficiency and public success in that capacity made him the subject of jealousies and accusations, resulting in his recall after five or six years of the most effective administration of the affairs of those colonies. Oxenstiern had the breadth and penetration to understand his real worth, and appointed him the first governor of the New Sweden which since has become the great State of Pennsylvania. He lived less than five years in this new position, and died in Fort Christina, which he built and held during his last years of service on earth. He was a wise, laborious, and far-seeing man, consecrated with all his powers to the formation of a Free commonwealth on this then wild territory. His name has largely sunk away from public attention, as the work of the Swedes in general in the founding and fashioning of our commonwealth; but he and they deserve far better than has been awarded them. A few years ago (1876) some movement was for the first time made to erect a suitable monument to the memory of Minuit. Surely the founder of the greatest city in this Western World, and of the colonial possessions of two European nations, and the first president and governor of the two greatest States in the American Union, ranks among the great historic personages of his period; and his high qualities, noble spirit, and valuable services demand for him a grateful recognition which has been far too slow in coming. There is a debt owing to his name and memory which New York, Pennsylvania, and the American people have not yet duly discharged. And to these grand men, first of all, are we under obligation of everlasting thanks for our Free and happy old commonwealth. But without WILLIAM PENN to reinforce and more fully execute the noble plans, ideas, and beginnings which went before him, things perhaps never would have come to the fortunate results which he was the honored instrument in bringing about. This man, so renowned in the history of our State, and so specially honored by the peculiar Society of which he was a zealous apostle, was respectably descended. His grandfather was a captain in the English navy, and his father became a distinguished naval officer, who reached high promotion and gave his son the privileges of a good education. Penn was for three years a student in the University of Oxford, until expelled, with others, for certain offensive non-conformities. He was not what we would call religiously trained, but he was endowed with a strong religious nature, even bordering on fanaticism, so that he needed only the application of the match to set his whole being aglow and active with the profoundest zeal, whether wise or otherwise. And that match was early applied. When England had reached the summit of delirium under her usurping Lord Protector, Oliver Cromwell, there arose, among many other sects full of enthusiastic self-assertion, that of the Quakers, who were chiefly characterized by a profound religious, and oil: fanatical, opposition to the Established Church, as well as to the Crown. Coming in contact with one of their most zealous preachers, young Penn was inflamed with their spirit and became a vigorous propagator of their particular style of devotion. As the Quaker tenets respected the state as well as religion, the bold avowal of them brought him into collision with the laws, and several times into prison and banishment. But, so far from intimidating him, this only the more confirmed him in his convictions and fervency. By his familiarity with able theologians, such as Dr. Owen and Bishop Tillotson, as well as from his own studies of the Scriptures, he was deeply grounded in the main principles of the evangelic faith. Indeed, he was in many things, in his later life, much less a Quaker than many who glory in his name, and all his sons after him found their religious home in the Church of England, which, to Quakers generally, was a very Babylon. But he was an honest-minded, pure, and cultured Christian believer, holding firmly to the inward elements of the orthodox faith in God and Christ, in Revelation and Eternal Judgment, in the Rights of Man and the Claims of Justice. If some of his friends and representatives did not deal as honorably with the Swedes in respect to their prior titles to their improved lands as right and charity would require, it is not to be set down to his personal reproach. And his zeal for his sect and his genuine devotion to God and Religious Liberty, together with a large-hearted philanthropy, were the springs which moved him to seize the opportunity which offered in the settlement of his deceased father’s claim on the government to secure a grant of territory and privilege to form a Free State in America – first for his own, and then for all other persecuted people. It may be that Penn has been betimes a little overrated. He has, and deserves, a high place in the history of our commonwealth, but he was not the real founder of it; for its foundations were laid years before he was born and more than forty years before he received his charter. He founded Pennsylvania only as Americus Vespucius discovered America. Neither was he the author of those elements of Free Government, Equal Rights, and Religious Liberty which have characterized our commonwealth. They were the common principles of Luther and the Reformation, and were already largely embodied for this very territory6 long before Penn’s endeavors, as also, in measure, in the Roman Catholic colony of Maryland from the same source. Nor was he, in his own strength, possessed of so much wise forethought and profound legislative and executive ability as that with which he is sometimes credited. But he was a conscientious, earnest, and God-fearing man, cultured by education and grace, gifted with admirable address, sincere and philanthropic in his aims, and guided and impelled by circumstances and a peculiar religious zeal which Providence overruled to ends far greater than his own intentions or thoughts. and repetitions between them and the English, which had long before been made between them and the Swedes, who did more for these barbarian peoples than he, and who helped him in the matter more than he helped himself. We are not fully informed respecting all the first instructions given to Governor Minuit when he came hither with Pennsylvania’s original colony in 1637-38, but there is every reason to infer that they strictly corresponded to those given to his successor, Governor Printz, five years afterward, on his appointment in 1642, about which there can be no question. Minuit entered into negotiations with the Indians the very first thing on his landing, and purchased from them, as the rightful proprietors, all the land on the western side of the river from Henlopen to Trenton Falls; a deed for which was regularly drawn up, to which the Indians subscribed their hands and marks. Posts were also driven into the ground as landmarks of this treaty, which were still visible in their places sixty years afterward. Governor Printz arrived in this country in 1642, and with him came Rev. John Campanius as chaplain and pastor of the Swedish colony. His grandson, Thomas Campanius Holm, many years after published numerous items put on record by the elder Campanius, in which it appears that the commands to Printz respecting the Indians were very scrupulously carried out. According to these records, the Indians were very familiar at the house of the elder Campanius, and he did much to teach and Christianize them. “He generally succeeded in making them understand that there is one Lord God, self-existent and one in three Persons; how the same God made the world, and made man, from whom all other men have descended; how Adam afterward disobeyed, sinned against his Creator and involved all his descendants in condemnation; how God sent His only-begotten Son Jesus Christ into the world, who was born of the Virgin Mary and suffered for the saving of men; how He died upon the cross, and was raised again the third day; and, lastly, how, after forty days, He ascended into heaven, whence He will return at a future day to judge the living and the dead,” etc. And so much interest did they take in these instructions, and seemed so well disposed to embrace Christianity, that Campanius was induced to study and master their language, that he might the more effectually teach them the religion of Christ. He also translated into the Indian language the Catechism of Luther, perhaps the very first book ever put into the Indian tongue. When Mr. Rising became governor of the Swedish colony he invited ten Indian chiefs, or kings, to a friendly conference with him. It was held at Tinicum, on the Delaware, June 17, 1654, when the governor saluted them, in the name of the Swedish queen, with assurances of every kindness toward them, and proposed to them a firm renewal of the old friendship. Campanius has given a minute account of this conference, and recites the speech in which one of the chiefs, named Naaman, testified how good the Swedes had been to them; that the Swedes and Indians had been in the time of Governor Printz as one body and one heart; that they would henceforward be as one head, like the calabash, which has neither rent nor seam, but one piece without a crack; and that in case of danger to the Swedes they would ever serve and defend them. It was at the same time further arranged and agreed that if any trespasses were committed by any of their people upon the property of the Swedes, the matter should be investigated by men chosen from both sides, and the person found guilty “should be punished for it as a warning to others.”10 This occurred when William Penn was but ten years of age, and twenty-eight years before his arrival in America. 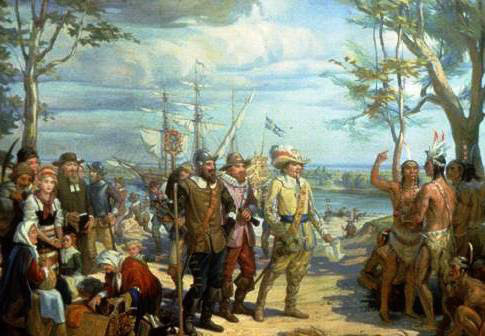 And upon the subject of the help which the Swedes rendered to Penn in his dealings with these people in the long after years, Acrelius writes: “The Proprietor ingratiated himself with the Indians. The Swedes acted as his interpreters, especially Captain Lars (Lawrence) Kock, who was a great favorite among the Indians. He was sent to New York to buy goods suitable for traffic. He did all he could to give them a good opinion of their new ruler”11; and it was by means of the aid and endeavors of the Swedes, more than by any influence of his own, that Penn came to the standing with these people to which he attained, and on which his fame in that regard rests. But still, as a man, a colonist, a governor, and a friend of the race, we owe to William Penn great honor and respect, and his arrival here is amply worthy of our grateful commemoration. The location and framing of this goodly city [Philadelphia], and a united and consolidated Pennsylvania established finally in its original principles of common rights and common freedom, are his lasting monument. If he was not the spring of our colonial existence, he was its reinforcement by a strong and fortunate stream, which more fully determined the channel of its history. If the Doctrine of Liberty of Conscience and Religion, the Principles of Toleration and Common Rights, and the embodying of them in a Free State open to all sufferers for conscience’ sake, did not originate with him, he performed a noble work and contributed a powerful influence toward their final triumph and permanent establishment on this territory. And his career, taken all in all, connects his name with an illustrious service to the cause of freedom, humanity, and even Christianity, especially in its more practical and ethical bearings. Such, then, were the men most concerned in founding and framing our grand old commonwealth. They were men of faith, men of thorough culture, men of mark by birth and station, men who had learned to grapple with the great problem of human rights, human happiness, human needs, and human relations to heaven and earth. They believed in God, in the revelation of God, in the Gospel of Christ, in the responsibility of the soul to its Maker, and in the demands of a living charity toward God and all His creatures. And their religious faith and convictions constituted the fire which set them in motion and sustained and directed their exertions for the noble ends which it is ours so richly to enjoy. Had they not been the earnest Christians that they were, they never could have been the men they proved themselves, nor ever have thought the thoughts or achieved the glorious works for ever connected with their names. We are apt to contemplate Christian faith and devotion only in its more private and personal effects on individual souls, the light and peace it brings to the true believer, and the purification and hope it works in the hearts of those who receive it, whilst we overlook its force upon the great world outside and its shapings of the facts and currents of history. We think of Luther wrestling with his sins, despairing and dying under the impossible task of working out for himself an availing righteousness, and rejoice with him in the light and peace which came to his agonized soul through the grand and all-conditioning Doctrine of Justification by simple Faith in an ll-sufficient Redeemer; but we do not always realize how the breaking of that evangelic principle into his earnest heart was the incarnation of a power which divided the Christian ages, brought the world over the summit of the watershed, and turned the gravitation of the laboring nations toward a new era of liberty and happiness. And so we refer to the spiritual training of a Gustavus Adolphus and an Axel Oxenstiern in the simple truths of Luther’s Catechism and the restored Gospel, and to the opening of the heart of a William Penn to the exhortations of Friend Loe to forsake the follies of the corrupt world and seek his portion with the pure in heaven, and mark the unfoldings of their better nature which those blessed instructions wrought; whilst we fail to note that therein lay the springs and germs which have given us our grand commonwealth and established for us the Free institutions of Church and State in which we so much glory and rejoice. Ah, yes; there is greatness and good and blessing untold for man and for the world in the personal hearing, believing, and heeding of the Word and testimony of God. No man can tell to what new impulses in human history, or to what new currents of benediction and continents of national glory, it may lead for souls in the school of Christ to open themselves meekly to the inflowings of Heaven’s free grace. It was the sowing of God’s truth and the planting of God’s Spirit in these men’s hearts that most of all grew for us our country and our blessed liberties. SECTION II. THE PRINCIPLES ENTHRONED. THE religious element in man is the deepest and most powerful in his nature. It is that also which asserts and claims the greatest independence from external constraints. It is therefore the height of unwisdom, not to say tyranny, for earthly magistracy to interfere by penalty and sword with the religious opinions and movements of the people, so long as civil authority and public order are not invaded and the rights of others are not infringed. In such cases it is always best to combat only with the Word of God. If of men it will come to naught, and if of God it cannot be suppressed. Reaction against wrongs done to Truth and Right is sure to come, and will push through to revolution and victory in spite of all unrighteous power. It is vain for any human governments to think to chain up the honest convictions of the soul. God made it Free, and sooner or later it will be Free, in spite of everything. It was largely the weight and current of such reaction against arbitrary interference with the religious convictions and Free Conscience of man that furnished the impulse to the original peopling of our State and country, and gave shape to the constitution and laws of this commonwealth for the last two hundred years. Nor will our inquiries and showings with regard to the founding of Pennsylvania be complete without something more respecting the leading principles which governed in that fortunate movement. Part I: OUR STATE THE PRODUCT OF FAITH. It is a matter of indisputable fact that the founding of our commonwealth was one of the direct fruits of the revived Gospel of Christ. But a little searching into the influences most active in the history is required to show that it was religious conviction and faith, more than anything else, that had to do with the case. Changes had come. Luther had found the Bible chained, and set it free. Apostolic Christianity had reappeared, and was re-uttering itself with great power among the nations. Its quickening truths and growing victories were undermining the gigantic usurpations and falsehoods which for ages had been oppressing our world. Conscience, illuminated and revived by the Word of God, had risen up to assert its Rights of Free Judgment and Free Worship, and resentful power had drawn the sword to put it down. Continental Europe was being deluged with blood and devastated by relentless religious wars to crush out the evangelic faith, whose Confessors held up the Bible over all popes and secular powers, and would not consent to part with their inalienable charter from the Throne of Heaven to worship God according to His Word. And amid these woeful struggles the good providence of the Almighty opened up to the attention of the nations the vast new territories of this Western World. From various motives, indeed, were the several original colonies of America founded. Some of the colonists came from a spirit of adventure. Some came for territorial aggrandizement and national enrichment. Some came as mercantile speculators. And each of these considerations may have entered somewhat into the most of these colonization schemes. But it was mainly flight from oppression on account of religious convictions which influenced the first colony of New England, and a still freer religious motive induced the colonization of Pennsylvania. All the men most concerned in the matter were profoundly religious men and thorough and active believers in revived Christianity; and it was most of all from these religious feelings and impulses that they acted in the case. It is plain, therefore, that the spirit of religion, the spirit of evangelical missions, the spirit of Christian charity, and the spirit of devotion to the protection of Religious Liberty and Freedom of Conscience were the dominating motives on the part of those who founded the first permanent settlement on the territory of Pennsylvania. THE FEELINGS OF WILLIAM PENN. Bating somewhat the missionary character of the enterprise, the same may be said of William Penn and his great reinforcement to what had thus been successfully begun long before his time. He was himself a very zealous preacher of religion, though more in the line of protest against the world and the existing Church than in the line of positive Christianity and the conversion and evangelization of the heathen. He had himself been a great sufferer for his religious convictions, along with the people whose cause he had espoused and made his own. His controlling desire was to honor and glorify God in the founding of a commonwealth in which those of his way of thinking might have a secure home of their own and worship their Creator as best agreed with their feelings and convictions, without being molested or disturbed; offering at the same time the same precious boon to others in like constraints willing to share the lot of his endeavors. His own account of the matter is: “For my country I eyed the Lord in obtaining it; and more was I drawn inward to look to him, and to owe it to his hand and power, than to any other way. I have so obtained it, and desire to keep it, that I may not be unworthy of his love, but do that which may answer his kind providence and serve his truth and people, that an example may be set up to the nations. There may be room there, though not here, for such an holy experiment.” “I do therefore desire the Lord’s wisdom to guide me and those that may be concerned with me, that we may do the thing that is truly wise and just.” And with these aims and this spirit he invited people to join him, came to the territory which had been granted him, conferred with the Swedish and Dutch colonists already on the ground, and together with them established the Commonwealth of Pennsylvania. Part II: RECOGNITION OF THE DIVINE BEING. Accordingly, also, the chief cornerstone in the constitutional fabric of our State was the united official acknowledgment of the being and supremacy of one eternal and ever-living God, the Judge of all men and the Lord of nations. The self-existence and government of Almighty God is the foundation of all things. Nothing is without Him. And the devout and dutiful recognition of Him and the absolute supremacy of His laws are the basis and chief element of everything good and stable in human affairs. He who denies this or fails in its acknowledgment is so far practically self-stultified, beside himself, outside the sphere of sound rationality, and incapable of rightly understanding or directing himself or anything else. Nor could those who founded our commonwealth have been moved as they were, or achieved the happy success they did, had it not been for their clear, profound, and practical acknowledgment of the being and government of that good and almighty One who fills immensity and eternity, and from Whom, and by Whom, and to Whom are all things. Some feel and act as if it were an imbecility, or a thing only for the weak, timid, and helpless, to be concerned about an Almighty God. But greater, braver, and more manly men did not then exist than those who were most prominent and active in founding and framing our commonwealth; and of a11 men then making themselves felt in the affairs of our world, they were among the most honest and devout in the practical confession of the eternal being and providence of Jehovah. And what was thus wrought into the texture of his being he also wove into the original constitution of our State. for it was deemed and believed on all hands that neither permanence nor happiness, enduring order nor prosperity, could come from any other principle than that of the recognition of the supremacy and laws of Him from Whom all things proceed and on Whom all creatures depend. provided, further, that no person antagonizing this confession, or refusing to profess the same, or convicted of unsober or dishonest conversation, should ever hold office in this commonwealth. And so entirely did this, and what else was then and there enacted and ordained, fall in with the teachings, feelings, and beliefs of the hardy and devoted Swedish Lutherans, who had here been professing and fulfilling the same for two scores of years preceding, that they not only joined in the making of these enactments, but sent a special deputation to the governor formally to assure him that, on these principles and the faithful administration of them, they would love, serve, and obey him with all they possessed. Nor can it ever be known in this world how much of the success, prosperity, and happy conservatism which have marked this commonwealth in all the days and years since, have come directly from this planting of it on the grand corner-stone of all national stability, order, and happiness. Surely, a widely different course and condition of things would have come but for this secure anchoring of the ship on the everlasting Rock. And a thousand pities it is that the influence of French atheism was allowed to exclude so wholesome a principle from the Declaration of our national Independence and from our national Constitution. Whilst such recognition of Jehovah’s supremacy and government abides in living force in the hearts of the people, the absence of its official formulation may be of no material disadvantage; but for the better preservation of it in men’s minds, and for the obstruction of the insidious growth of what strikes at the foundation of all government and order, it would have been well had the same been put in place as the grand corner-stone of our whole national fabric, as it was in the original organization of the Commonwealth of Pennsylvania, and kept in both clear and unchangeable forever. We might then hope for better things than are indicated by the present drift, and the outlook for those to come after us would be less dark and doubtful than it is. But, since weakenings and degeneration in these respects have come into the enactments of public power, it is all the more needful for every true and patriotic citizen to be earnest and firm in witnessing for God and His everlasting laws, that the people may be better than the later expressions of their state documents. The example of the fathers makes appeal to the consciences of their children not to let go from our hearts and lives the deep and abiding recognition and confession of that almighty Governor of all things from Whose righteous tribunal no one living can escape, and before Whom no contemner of His authority can stand. Another great and precious principle enthroned in the founding of our commonwealth was that of Religious Liberty. One of the saddest chapters in human history is that of persecution on account of religious convictions – the imposition of penalties, torture, and death by the sword of government on worthy people because of their honest opinions of duty to Almighty God. For the punishment of the lawless, the wicked, and the intractable, and for the praise, peace, and protection of them that do well, the civil magistrate is truly the authorized representative of God, and fails in his office and duty where the powers he wields are not studiously and vigorously exercised to these ends. But God hath reserved to Himself, and hath not committed to any creature hands, the power and dominion to interfere with the realm of conscience. As He alone can instruct and govern it, and as its sphere is that of the recognition of His will and law and the soul’s direct amenability to His judgment-bar, it is a gross usurpation and a wicked presumption for any other authority or power to undertake to force obedience contrary to the soul’s persuasion of what its Maker demands of it as a condition of His favor. It is a principle of human action and obligation recognized in both Testaments, that when the requirements of human authority conflict with those of the Father of spirits we must obey God rather than man. The Rights of Conscience and the rights of God thus coincide, and to trample on the one is to deny the other. And when earthly governments invade this sacred territory they invade the exclusive domain of God and make war upon the very Authority from which they have their right to be. The plea of its necessity for the support of orthodoxy, the maintenance of the Truth, and the glory of God will not avail for its justification, for God has not ordained civil government to inflict imprisonment, exile, and death upon religious dissenters, or even heretics; and His truth and glory He has arranged to take care of in quite another fashion. What Justin Martyr and Tertullian in the early Church and Luther in the Reformation-time declared, must forever stand among the settled verities of Heaven: that it is not right to murder, burn, and afflict people because they feel in conscience bound to a belief and course of life which they have found and embraced as the certain will and requirement of their Maker. We must ward off heresy with the sword of the Spirit, which is the Word of God, and not with the sword of the state and with fire. And yet such abuses of power have been staining and darkening all the ages of human administration, and, unfortunately, among professing Christians as well as among pagans and Jews. Intolerance is so rooted in the selfishness and ambition of human nature that it has ever been one of the most difficult of practical problems to curb and regulate it. Those who have most complained of it whilst feeling it, often only needed to have the circumstances reversed in order to fall into similar wickedness. The Puritans, who fled from it as from the Dragon himself, soon had their Star-Chamber too, their whipping-posts, their death-scaffolds, and their sentences of exile for those who dissented from their orthodoxy and their order. Even infidelity and atheism, always the most blatant for freedom when in the minority, have shown in the philosophy of Hobbes and in the Reign of Terror in France that they are as liable to be intolerant, fanatical, and oppressive when they have the mastery as the strongest faith and the most assured religionism. And the Quakers themselves, who make Freedom of Conscience one of the chief cornerstones of their religion, have not always been free from offensive and disorderly aggressions upon the rightful sphere of government and the rightful Religious Freedom of other worshipers. Even so treacherous is the human heart on the subject of just and equal religious toleration. It is therefore a matter of everlasting gratitude and thanksgiving that all the men most concerned in the founding of our commonwealth were so clear and well-balanced on the subject of Religious Liberty, and so thoroughly inwove the same into its organic constitution. Gustavus Adolphus and Axel Oxenstiern were the heroes of their time in the cause of Religious Liberty in continental Europe. Though intensely troubled in their administration by the Roman Catholics and the Anabaptists, the most intolerant of intolerants in those days, they never opposed force against the beliefs or worships of either; and when force was used against the papal powers, it was only so far as to preserve unto themselves and their fellow-confessors the inalienable right to worship God according to the dictates of their own consciences without molestation or disturbance. In their scheme of colonization in this Western World, first and last, the invitation was to all classes of Christians in suffering and persecution for conscience’ sake, who were favorable to a Free State where they could have the free enjoyment of their property and religion, to cast in their lot. In the first charter, confirmed by all the authorities of the kingdom and rehearsed in the instructions given by the throne for the execution of the intention, special provision was made for the protection of the convictions and worship of those not of the same confession with that for which the government provided. Though a Lutheran colony, under a Lutheran king, sustained and protected by a Lutheran government, the Calvinists had place and equal protection in it from the very beginning; and when the Quakers came, they were at once and as freely welcomed on the same free principles, as also the representatives of the Church of England. As to William Penn, though contemplating above all the well-being and furtherance of the particular Society of which he was an eminent ornament and preacher, consistency with himself, as well as the established situation of affairs, demanded of him the free toleration of the Church, however unpalatable to his Society, and with it of all religious sects and orders of worship. From his prison at Newgate he had written that the enaction of laws restraining persons from the free exercise of their consciences in matters of religion was but “the knotting of whipcord on the part of the enactors to lash their own posterity, whom they could never promise to be conformed for ages to come to a national religion.” Again and again had he preached and proclaimed the folly and wickedness of attempting to change the religious opinions of men by the application of force – the utter unreasonableness of persecuting orderly people in this world about things which belong to the next – the gross injustice of sacrificing anyone’s liberty or property on account of creed if not found breaking the laws relating to natural and civil things. In these specific provisions all classes in the colony at the time heartily united. And thus was secured and guaranteed to every good citizen that full, rightful, and precious religious freedom which is the birthright of all Americans, for which the oppressed of all the ages sighed, and which had to make its way through a Red Sea of human tears and blood and many a sorrowful wilderness before reaching its place of rest. Part IV: SAFEGUARDS TO TRUE LIBERTY. But the Religious Liberty which our fathers thus sought to secure and to transmit to their posterity was not a licentious libertinism. They knew the value of religious principles and good morals to the individual and to the state, and they did not leave it an open matter, under plea of Free Conscience, for men to conduct themselves as they please with regard to virtue and religion. To be disrespectful toward divine worship, to interfere with its free exercise as honest men are moved to render it, or to set at naught the moral code of honorable behavior in human society, is never the dictate of honest conviction of duty, and, in the nature of things, cannot be. It is not conscience, but the overriding of conscience; nay, rebellion against the whole code of conscience, against the foundations of all government, against the very existence of civil society. Liberty to blaspheme Almighty God, to profane His name and ordinances, to destroy His worship, and to set common morality at naught, is not Religious Liberty, but disorderly wickedness, a cloak of maliciousness, the licensing of the devil as an angel of light. It belongs to mere brute liberty, which must be restrained and brought under bonds in order to render true liberty possible. Wild and lawless freedom must come under the restraints and limits of defined order, peace, and essential morality, or somebody’s freedom must suffer, and social happiness is out of the question. And it is one of the inherent aims and offices of government to enforce this very constraint, without which it totally fails of its end and forfeits its right to be. Where people are otherwise law-abiding, orderly, submissive to the requisites for the being and well-being of a state, and abstain from encroachments upon the liberties of others, they are not to be molested, forced, or compelled in spiritual matters contrary to their honest convictions; but public blasphemy, open profanity, disorderly interference with divine worship and reverence, and the hindrance of what tends to the preservation of good morals, it pertains to the existence and Office of a state to restrain and punish. Severity upon such disorders is not tyrannical abridgment of the Rights of Conscience, for no proper citizen’s conscience can ever prompt or constrain him to any such things. And everything which tends to weaken and destroy regard for the eternal Power on which all things depend, to relax the sense of accountability to the Divine Judgment, and to trample on the laws of eternal morality, is the worst enemy of the state, which it cannot allow without peril to its own existence. On the other hand, the state is bound for the same reasons to protect and defend religion in general and the cultivation of the religious sentiments, in so far, at least, as the laws of virtue and order are not transgressed in the name of religion. It may not interfere to decide between different religious societies or churches, as they may be equally conscientious and honest in their diversities; but where the tendency is to good and reverence, and the training of the community to right, and orderly life, it belongs to the Office and being of the state not only to tolerate, but to protect them all alike. In the fatherly care of its subjects, the people consenting, the state may also recommend and provide support for some particular and approved order of faith and worship, just as it provides for public education. And though the civil power may not rightfully punish, fine, imprison, and oppress orderly and honest citizens for conscientious non-conformity to any one specific system of belief and worship, it may, and must, provide for and protect what tends to its rightful conservation, and also condemn, punish, and restrain whatsoever tends to unseat it and undermine its existence and peace. These are fundamental requirements in all sound political economy. LAWS ON RELIGION AND MORALS. Our fathers, in their wisdom, understood this, and fashioned their state provisions and laws accordingly. But if public worship and religious instruction are to be fostered and preserved by the State, there must be set times for it, the people released at those times from hindering occupations and engagements, and whatever may interfere therewith restrained and put under bonds against interruption. In other words, the Lord’s proper worship demands and requires a protected “Lord’s Day.” Such appointed and sacred times for these holy purposes have been from the foundation of the world. Under all dispensations one day in every seven was a day unto the Lord, protected and preserved for such sacred uses, on which secular occupations should cease, and nothing allowed which would interfere with the public worship of Almighty God and the handling of His Word. And “because it was requisite to appoint a certain day, that the people might know when they ought to come together, it appears that the Christian Church [and so all Christian States] did for that purpose appoint the Lord’s Day,” our weekly Sunday. “that, according to the good example of the primitive Christians and the ease of the creation, every first day of the week, called the “Lord’s Day,” people shall abstain from their common daily labor, that they may the better dispose themselves to Worship God according to their understandings” – a provision so necessary and important that the statute laws of our commonwealth have always guarded its observance with penalties which the State cannot in justice to itself allow to go unenforced, and which no good citizen should refuse strictly to obey. Such were the good and righteous provisions made for the restraint of the licentiousness and brutishness of man in the primeval days of our commonwealth; and wherein it has since sunk away from these original organic laws the people have only weakened and degraded themselves, and hindered that virtuous and happy prosperity which would otherwise in far larger degree than now be our inheritance. Part V: FORMS OF GOVERNMENT. And yet again, as the fathers of our commonwealth gave us religion without compulsion, so they also gave us a State without a king. Governments depend on men, not men on governments. Let men be good, and the government will not be bad; but if men are bad, no government will hold for good. If government be bad, good men will cure it; and if the government be good, bad men will warp and spoil it. Nor is there any form of government known to man that is not liable to abuse, prostitution, tyranny, unrighteousness, and oppression. But there may be liberty under monarchy, as well as reverence and obedience under democracy, whilst there may be oppression and bloody tyranny under either. Amid the varied experiments of the ages the human mind is more and more settling itself in favor of mixed forms of government, in which the rights of the people and the limitations of authority are set down in fixed constitutions, taking the direct rule from the multitude, but still holding the rulers accountable to the people.15 Such were more or less the forms under which the founders of our commonwealth were tutored. THE LAST TWO HUNDRED YEARS. That blessing we have lived to see. May it continue for yet many centennials, and grow as it endures! May the faith and spirit of the men through whose piety and wisdom it has come still warm and animate the hearts of their successors to the latest generations! May no careless or corrupt administration of justice or “looseness” or infidelities of the people come in to bring down the wrath of Heaven for its interruption! May the sterling principles of our happy freedom be made good to us and our posterity by the good keeping of them in honest virtue and obedience, and in due reverence of Him who gave them, and who is the God and Judge of nations! May those sacred conditions of the divine favor “which descend not with Worldly inheritances” be so embedded in the training and education of our youth that the spirit of the children may not be a libel on the faith and devotion of their fathers! Centuries have passed, but the God of Gustavus Adolphus, of the Pilgrims of Plymouth Rock, of William Penn, and of the hero-saints of every age and country still lives and reigns. Men may deny it, but that does not alter it. His government and Gospel are the same now that they have ever been. What he most approved and blessed in their days he most approves and blesses in ours. And may their fear and love of him be to us and our children a copy and a guide, to steer in safety amid the dangerous rapids of these doubtful times! An Enlightenment document, but NOT a “Deistic” document. The god of the Deist is not a Creator in the sense it is used in the Declaration (i.e., of persons who have personal reference to “their” Creator), but is an impersonal force – an “uncaused cause” or “one prime mover”; the god of the Deist is not a Judge, but is benevolently uninvolved and uninterested; the god of the Deist has absolutely no involvement or interest in the affairs of man, that it would have a need to Providentially orchestrate them to achieve its interests for their benefit and its glory. On the contrary, these are all terms and usages unique to Christian theology. “When he now beheld that the cause of Protestantism was menaced more seriously than ever throughout the whole of Germany, he took the decisive step, and, formally declaring war against the emperor, he, on the 24th of June, 1630, landed on the coast of Pomerania with fifteen thousand Swedes. As soon as he stepped upon shore he dropped on his knees in prayer, while his example was followed by his whole army. Truly he had undertaken, with but small and limited means, a great and mighty enterprise.” “The Swedes, so steady and strict in their discipline, appeared as protecting angels, and as the king advanced the belief spread far and near throughout the land that he was sent from heaven as its preserver.” — History of Germany, by Kohlrausch, pp. 328, 329. “Bavaria and the Tyrol excepted, every province throughout Germany had battled for Liberty of Conscience, and yet the whole of Germany, notwithstanding her universal inclination for the Reformation, had been deceived in her hopes: a second Imperial edict seemed likely to crush the few remaining privileges spared by the edict of restitution... Gustavus, urged by his sincere piety, resolved to take up arms in defense of Protestantism and to free Germany from the yoke imposed by the Jesuits.” — Menzel’s History of Germany, vol. ii. pp. 345, 346. The death of Gustavus Adolphus is thus described by Kohlrausch: “The king spent the cold autumnal night in his carriage, and advised with his generals about the battle. The morning dawned, and a thick fog covered the entire plain; the troops were drawn up in battle-array, and the Swedes sang, accompanied with trumpets and drums, Luther’s hymn, Ein feste Burg ist unser Gott (‘A Mighty Fortress is our God’), together with the hymn composed by the king himself, Verzage nicht, du Häuﬂein klein (‘Fear not the Foe, thou Little Flock’). Just after eleven o’clock, when the sun was emerging from behind the clouds, and after a short prayer, the king mounted his horse, placed himself at the head of the right wing – the left being commanded by Bernard of Weimar – and cried, ‘Now, onward! May our God direct us! – Lord, Lord! help me this day to fight for the glory of thy name!’ and, throwing away his cuirass with the words, ‘God is my shield!’ he led his troops to the front of the Imperialists, who were well entrenched on the paved road which leads from Lützen to Leipsic, and stationed in the deep trenches on either side. A deadly cannonade saluted the Swedes, and many here met their death; but their places were filled by others, who leaped over the trench, and the troops of Wallenstein retreated. Freedom of the Church from the Regulation of the State. Establishment of the Rule of Law, and Subjection of Governing Authorities to that Rule. The Right of the Governed to Material Participation, through Representation, in the Governing Process. The Right of the Accused to Trial by Jury.